All it took for Princess Abby to win the World’s Ugliest Dog contest was her DNA. After all, her ugliness was bred into her. 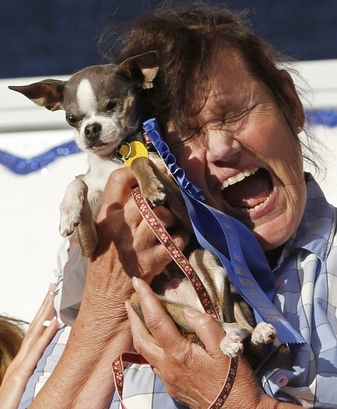 Princess Abby, a four-year-old Chihuahua owned by Kathleen Francis, was adopted less than 6 months ago, and already she’s proven herself to be a worthwhile addition to the Francis family after winning the World’s Ugliest Dog title at the Sonoma-Marin Fair in Petaluma, California. Abby bested a whole slate of other ugly critters using only her Chihuahua-style bad looks, a closed-up left eye, and oddly-curved back and legs thanks to inbreeding to claim the title and the $1000 grand prize. “I don’t think she’s ugly at all,” said Kathleen Francis, the dog’s owner. “I think she’s the most beautiful dog.” Any dog is a beautiful dog once it wins you $1000 and may have established itself a dynasty to replace the now-deceased world’s ugliest dog, Miss Ellie the Chinese Crested. I hate to say it, but this dog isn’t that ugly. She’s just a squinty chihuahua; they’re an ugly breed by nature, but there are plenty of dogs uglier.